Garganelli Prosciutto Pasta is a unique Prosciutto pasta recipe that will certainly have all who try it asking for seconds. 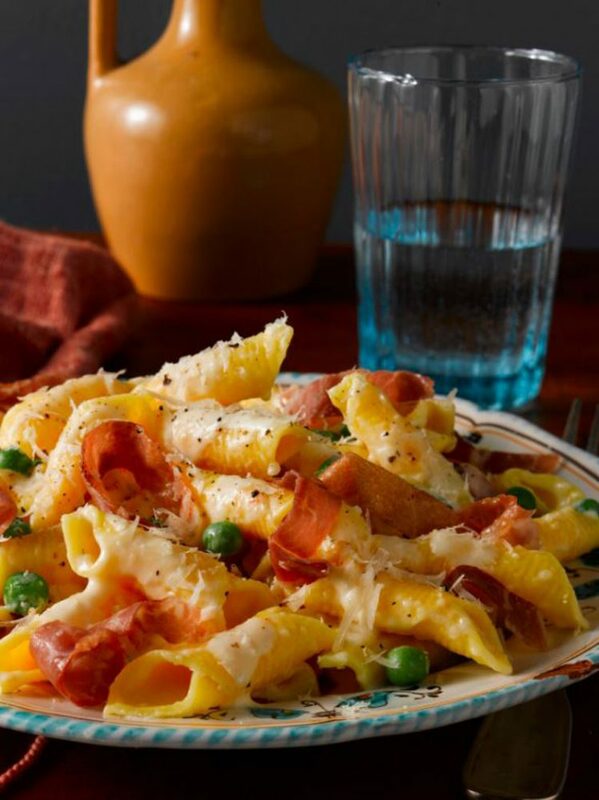 The rich and creamy sauce wonderfully complements the salty Prosciutto, and the garganelli is the perfect vessel to soak up all the creamy goodness. Enjoy this Prosciutto pasta dish with a glass of red wine and a side of greens for the perfect weeknight meal. Fill a medium saucepan two-thirds full with water; bring to a boil over high heat. Add peas and cook just until they turn bright green, about 30 seconds; immediately pour into a colander and rinse under cold water to preserve their color. Fill a large saucepan two-thirds full with water and salt, liberally. Bring to a boil over high heat. Add the pasta and cook until al dente, about 2 minutes for fresh or 9 minutes for dried. Meanwhile, in a large skillet, over medium-high heat, melt 1 tablespoon of the butter, tilting the pan to coat evenly. Add the Prosciutto, stirring 1 minute just to warm and infuse the butter with its flavor. Stir in the cream; lower the heat and simmer gently 5 minutes or until it reduces and thickens enough to coat the back of a wooden spoon. Stir in the peas and the remaining butter; remove from heat. Drain the pasta in a colander; shake off excess water. Add the hot pasta to the skillet. Toss to coat the pasta with the cream sauce. Stir in the grated Parmigiano-Reggiano cheese. Season with salt and pepper, to taste. Divide the pasta among 6 individual plates; finish with a few grinds of black pepper, if desired.